The Ryson Narrow Trak Spirals are great space savers with high throughput that can run at speeds in excess of 200 fpm. The nesting slats have the capacity to reliably end-transfer small cartons and packages or side-transfer small bottles or containers in a single file or in a continuous mass flow. 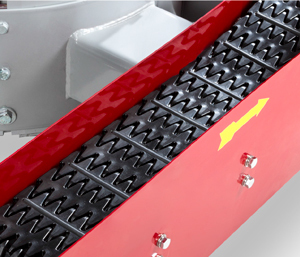 The spiral conveyors are equipped with our new 6” or 9” wide nesting slats which provide an efficient flat conveying surface without gaps. The Narrow Trak Spirals offer a significantly larger elevation change capacity than what is currently available in the small package marketplace. 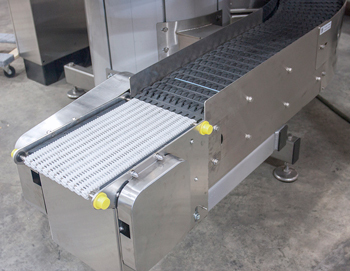 They are also a good alternative to side gripper conveyors because they can run at high speeds and do not need to be adjusted for varying product sizes. These spirals are powder coated to assure a durable finish. Also available in hybrid stainless steel versions suitable for wet applications. The Narrow Trak Spirals are especially beneficial for the food, beverage, pharmaceutical, nutraceutical, personal care market and food product companies. The nesting slats provide an efficient flat conveying surface without gaps and can be used for end-transfer or side-transfer. Available in 6” and 9” wide versions. Friction inserts can be added when additional grip is required. The Ryson micro-pitch transfer conveyor is slave-driven off the drive or idle-end shafts and is geared to match the speed of the spiral- perfectly – even at high speeds. This transfer unit minimizes the unpowered gap between the spiral and adjoining conveyors, allowing smaller and lighter products to be end transferred into and out of the spiral. When end transferring the slats can be equipped with friction inserts to provide more friction. This allows steeper incline/decline angles which yields greater elevation changes with the same number of turns. The Ryson modular design makes our spirals easy to configure and customize. 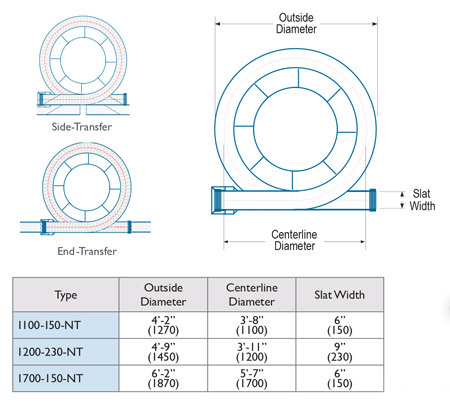 All our spirals are made to order and are available in four basic configurations as it relates to the position of the in and outfeed tangents as shown, (A, B, C and D) The angle of the tangents can also be customized to meet specific layout requirements (B-MA for example) All configurations can operate up or down and in a clockwise or counterclockwise rotation. Download the Ryson product spec sheet for the Narrow Trak Spiral. There are many features. 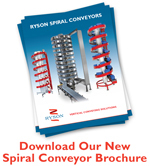 benefits and options to the Ryson Spiral Conveyors. Read more about them on our Spiral Conveyor Page, or download our Mass Flow Spiral Conveyor Brochure.